Good afternoon! 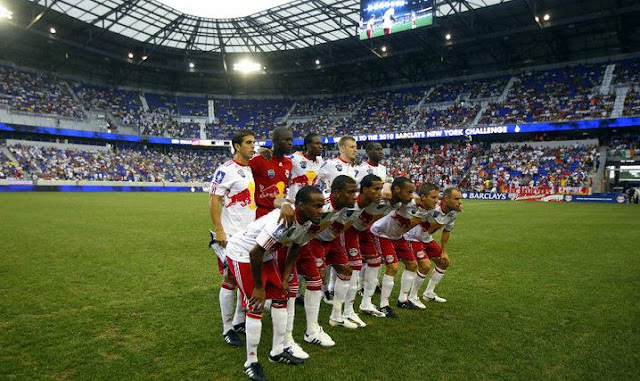 The Red Bulls finally return to MLS action today @The Cathedral of Football, Red Bull Arena (built by Makita). This time, Canada's own Toronto FC makes it's first visit to RBA. The Red Bulls will be looking forward to getting back to winning ways in MLS and put that massively dissapointing 0-0 draw @Chicago behind them. Seriously, it should have been 5-0, at the very least. And speaking of 5-0, the last time TFC came round these parts, the Canadians were on the wrong end of a 5-0 thrashing. Let's hope that Juan Pablo Angel, Thierry Henry & Mac Kandji are at their finest today, and we can replicate that scoreline once again. So with that, let's get to some predictions. OK so the 0-0 draw in Chicago was a massive disappointment, considering all the chances we created. Hell, Mac Kandji could have had a double hat trick by himself. And it was the same story in Houston - numerous chances wasted by lousy finishing. Sooner or later the dam is going to break and the goals will start raining in, but probably not against Toronto FC, who have a pretty stingy defense. Still I like us to put a few away and probably surrender one thanks to the very tall Canadian Greg Sutton, who will be subbing for Bouna. My prediction - goals by Henry and Lindpere. De Rosario gets one for the vistors, but the Red Bulls emerge victorious by a 2-1 score. I'm going to predict a Red Bulls victory as well. There's just no way our guys are not up for this one after dissapointing draws the last two games. They're @home now and they'll put several in the back of the net. I'm looking for a 3-1 Red Bulls victory. International call-ups are playing havoc with Coach Backe's ability to field his best XI, not only tonight, but looking ahead towards fielding a fit and rested side on Saturday as well. Most significantly, we are missing Rafa Marquez and Bouna Coundoul tonight. However, we dodged a bullet by not losing Joel Lindpere. I've read reports that said the coach decided not to call him up because he was playing on August 8th and would arrive late and tired. Then yesterday I read that Lindpere turned down the invitation. Who knows? Either way, we have him and the side will be improved for it. Honestly, with the exception of Greg Sutton in goal, and a tender-groined Thierry Henry up top, we'll be starting a side that resembles something we've seen all season. Some mish-mosh of Ubi, Stammler, Tchani, and Robinson will fill in the midfield around Lindpere and Kandji, I expect. Unfortunately, I'm not sure if that's enough. Our midfield looked so much better in one game with Marquez on the pitch, and Sutton has reliably given up a late goal nearly every time he's seen action. The hope will be that Henry's presence up top, and the extra space he creates for everyone else in the attack, will be enough--it will be if anyone on the Red Bulls decides to finish an opportunity, but I need to see that happen before I can predict it in the future. We've been struggling for several matches now, and tonight's side is a step backwards. I hate to say this, but I see the Red Bulls losing 2-1, Henry's first league goal won't be enough, and Kandji's half-dozen misses will do us in. I'll be hoping for a couple of extremely, um... professional fouls on de Guzman to provide the joy tonight. I am predicting a 2-2 draw with either Mendes or Ream making a massive error at the end of the game to throw 2 points away. As fluid as we have looked in the last two games away offensively I have no confidence in our central defenders. And ofcourse Greg Sutton will be in goa. That is another major concern. We'll that's all for now. We'll be back in the next day, or two, with our drunken game-day coverage. Viper Out!